You are working with Kendo UI and you want to automate your day-to-day testing procedures. It is easier to test a custom control framework when you know it from the inside. Let us show you how to do that with Telerik Test Studio, and Telerik Test Studio Dev Edition. 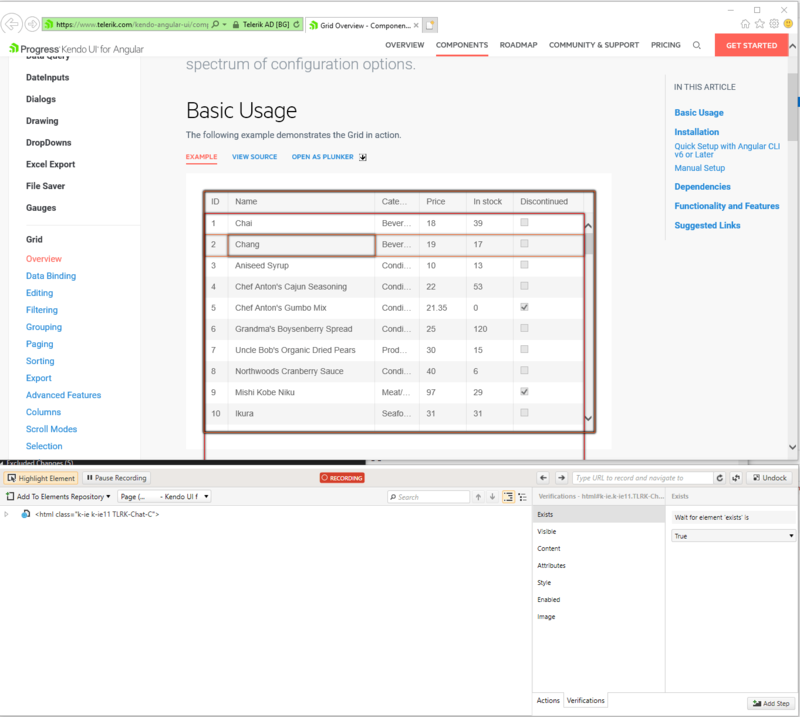 Test Studio and Test Studio Dev Edition have out-of-the-box support for Kendo UI for Angular, Kendo UI for jQuery and the Telerik UI for ASP.NET AJAX and UI for Silverlight. Every type of component is isolated in a separate library which can be found in the \Bin\Translators folder located inside the Test Studio installation folder. 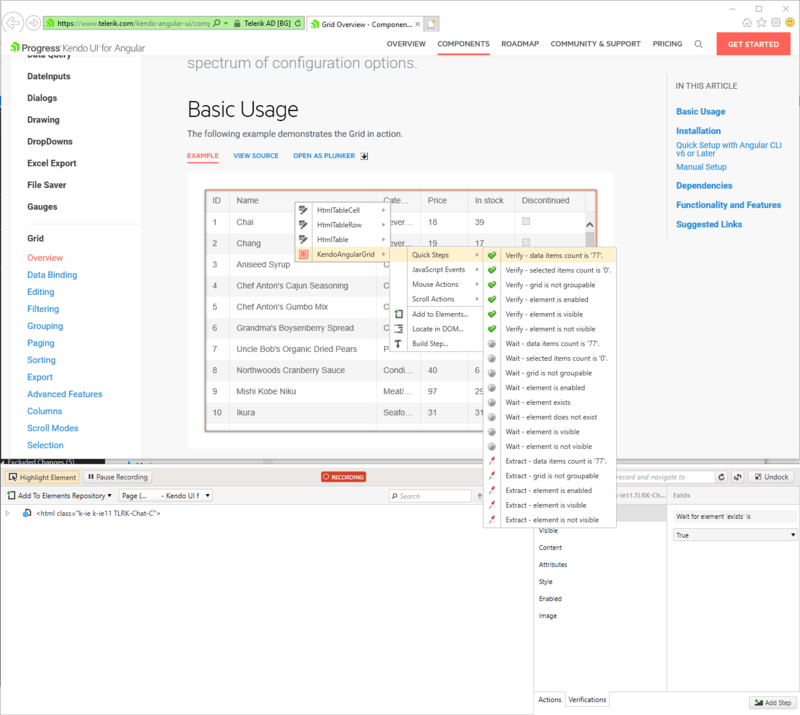 For example, if we want to test a web application which is using Kendo UI for Angular components, we should add references in our test project to the following libraries: Telerik.TestStudio.Translators.Common.dll and Telerik.TestingFramework.Controls.KendoUI.Angular.dll. To test a component, we first need to find it. 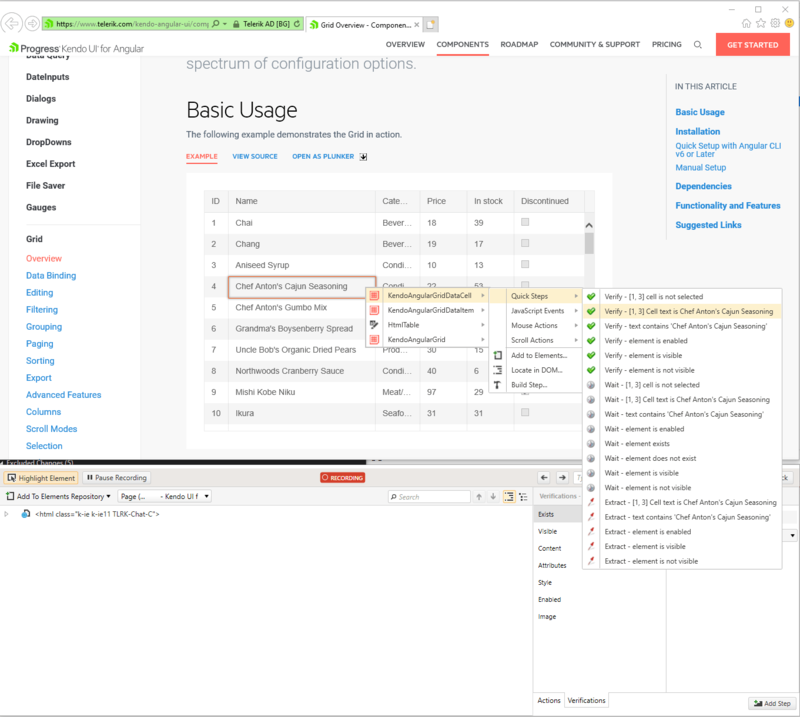 All Testing Framework and Test Studio find mechanisms are valid for this task, including the newly added CSS selector query. After finding the desired component it should be cast to the respective built-in control type. In the next example we will locate a <KendoAngularGrid> element and verify the number of currently displayed rows. Don't forget to include the required using statements! 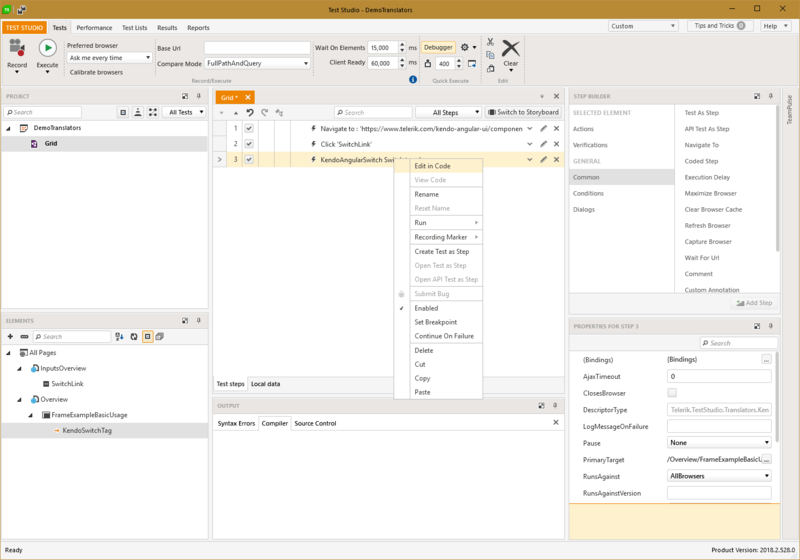 Furthermore, the built-in control types in Testing Framework and Test Studio provide methods for invoking actions specific to the respective Kendo UI component, which otherwise could be hard to trigger due to the internal event flow. In this example we will use a <KendoAngularSwitch> element, try to toggle its state and confirm that the change was successful. Once again, do not forget to include the necessary using statements! Now that we've played around with the API, let's see how we can do the same things the easy way. The Test Studio stand-alone application and Test Studio Dev Edition provide access to all of the above through a friendly and intuitive user interface. Here, when you hover the mouse over the element of your choice, you get a context-sensitive menu with translated components, together with actions and verifications available for these controls. Again, it really is that easy! There's also an easy way to record the action, specific to a given Kendo UI component. Instead of finding the element and casting it to the required type, and looking for the appropriate method to invoke, simply visually locate the desired component in your application page, point it with the mouse and perform the action you need. 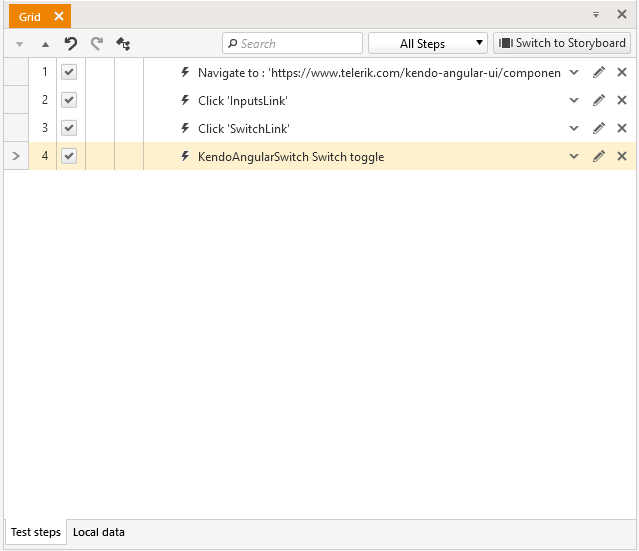 In the above case with the Kendo UI for Angular Switch control, just point at the element and toggle it. The action is readily recorded as a step in your test. Still, if you really, really love your code, don't worry. You can effortlessly convert what you've just clicked to code and it will still work, as if you just typed it in yourself. 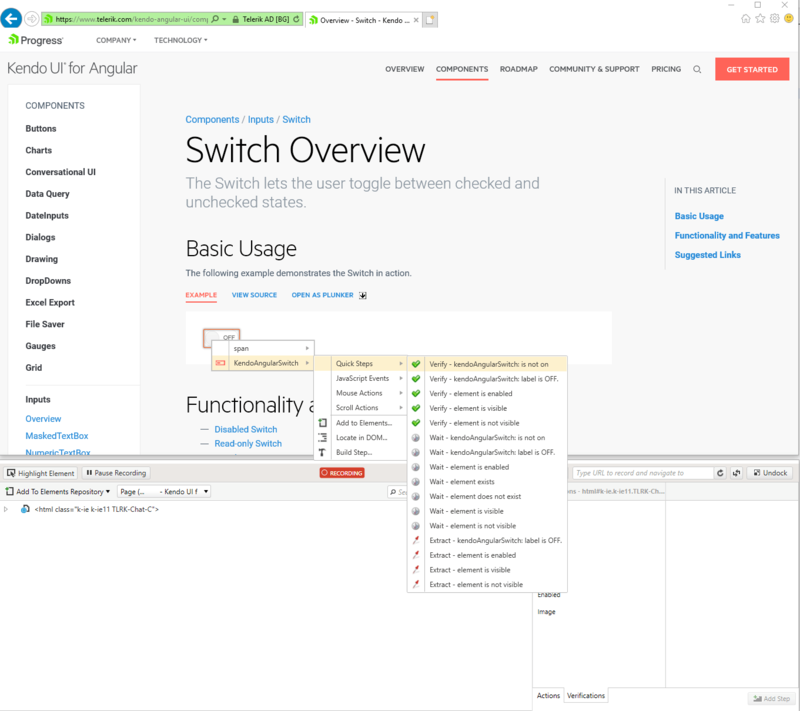 Side note: the generated code looks like it's missing something just because Test Studio has already silently performed the element discovery magic previously, when we clicked on the Kendo UI for Angular Switch element. Of course, you can do the same for all available verifications. All-in-all, Test Studio and Test Studio Dev Edition will indeed make your testing life much easier, and you should definitely keep it in mind when planning to automate your Kendo UI-based web application testing. Whether you like to write your own testing logic fully in code, or you would rather feel like spending more time on other automation tasks and wish to click your way through Kendo UI components testing automation, we provide you with the tooling to complete your day-to-day tasks. And, yes, it's lean and easy.